Amber kommt mit beigem naturbelassenem Kuhfell mit Gold-Nuancen, auf beigem Filz, gefädelt mit beigem Satinband und einer handgefertigten Quaste aus Nerz und Leder. Die Handtasche kann selbstverständlich auch als Dirndltasche oder Trachtentasche benutzt werden. Our Special Edition is strictly limited to 100 bags. 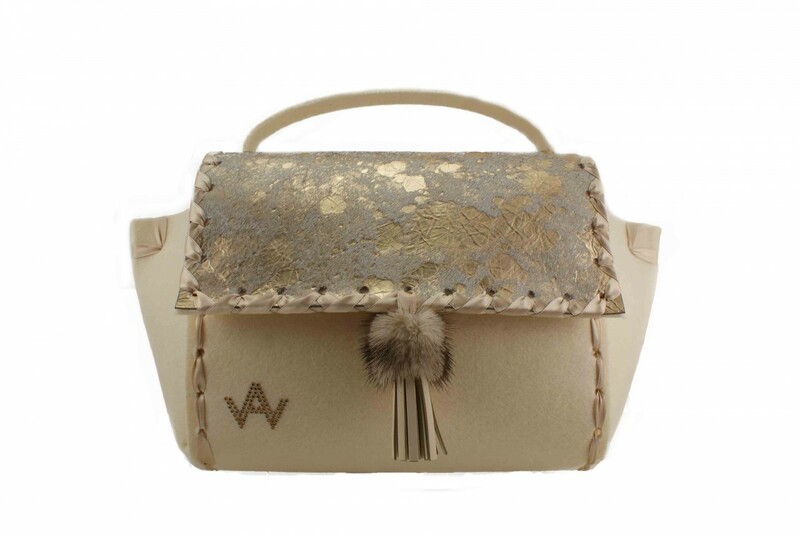 The fur-variant Angeldust comes with dyed cow-fur topped with gold-nuances on beige felt, flossed with a beige matching satin ribbon and a handmade tassel of mink and leather. The bag measures in maximum lengths (top, longest trapezial piece) 36 cm. The bottom is about 28 cm long. Height (without handle) is 22 cm, and depths measures 12 cm. To wear it over your shoulder, please have a look at our handle-extensions in our accessories.